Eibach Sportline is a suspension kit with more drop and stiffness than the Pro-Kit option. 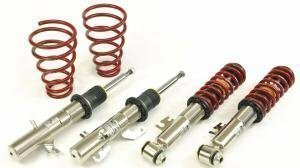 Among the Pro-Kit, Eibach Sportline are the springs which made Eibach known to everyone. Eibach Pro-Kit is a perfect lowering kit for street cars. These springs are the ones which made Eibach springs known to everyone. Height adjustable Pro-Street-S kits offer a very sportive driveability without sacrificing too much comfort. Height adjustment means the car is exactly at the height you want, and is extremely useful on cars used around the year - you can rise the car up to normal height for the winter and drop it back down for summer. Eibach B12 Pro-Kits are a combination of Eibach Pro-Kit springs and Bilstein B8 inverted shocks. This is a product which many of our customers buy every time they change car. The kit simply makes the user happy with it. Bilstein B8 shocks and Eibach Sportline springs combined into the Eibach B12 sportline kit for bigger amounts of lowering. Eibach Pro-Spacers are an excellent pair to go with Pro-Kit or Sportline lowering springs and when the wheel looks lack "it". 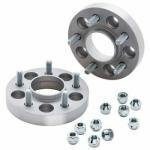 Spacers will bring out the wheels by the amount of their thickness.